Shape Partners with SME’s PRIME Program | Shape Corp.
Shape’s new partnership with the Society of Manufacturing Engineer’s PRIME program and Grand Haven High School has been making headlines all across West Michigan. 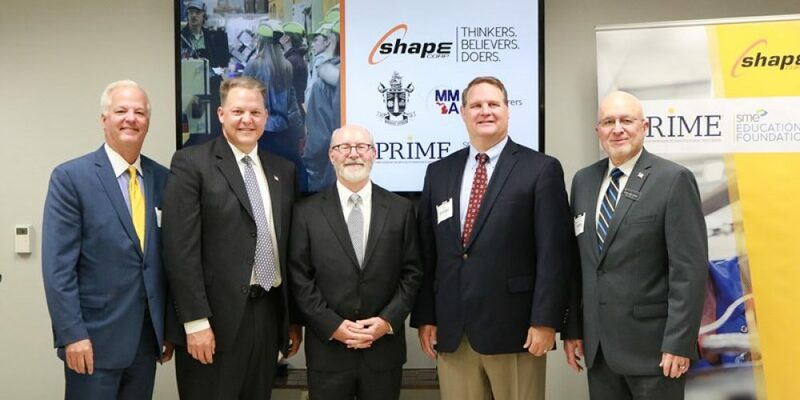 Last Monday, June 19, Shape announced alongside Grand Haven Area Public Schools, the Michigan Manufacturers Association, their collaboration through SME’s Partnership Response in Manufacturing Education (PRIME). The PRIME initiative will instill a manufacturing-based curriculum into Grand Haven High School. This new partnership will offer students a chance to gain the skills and the tools necessary to start a career in engineering and manufacturing, while allowing Shape to grow its talent pool. The funding that will be provided by Shape will allow administrators to train faculty and purchase equipment for students. Julie Davidson, talent acquisitionsmanager, discovered the PRIME initiative and knew Shape had to be a part of it. “The PRIME initiative really caught my attention because I feel they were the missing link. To have an organization who understands both the industry and educational systems is unique and makes a huge difference. I knew that I wanted to develop a high school internship and gain a deeper relationship with the local school system. However, I didn’t want to approach them without having something of real substance that would benefit both the students and our company,” Julie said. Shape’s partnership is uniting the community and creating new pathways for West Michigan’s youth. The PRIME program will open doors to introduce students to the opportunities within technical and manufacturing careers.